On November 9, 2010 the National Library of France opened a major new exhibit on Paris's most notorious prison, The Bastille. A jail may not be the first subject that springs to mind as the basis for a national library exhibit, but if any slammer can be called "the writer's prison," it is the Bastille. By chance and by design, the French Kings who had the power to imprison anyone, for any reason--or for no reason at all--wound up jailing some of France's most famous, and most infamous, 18th century writers. By Catherine Lusurier d'après Nicolas de Largillière, c. 1778. 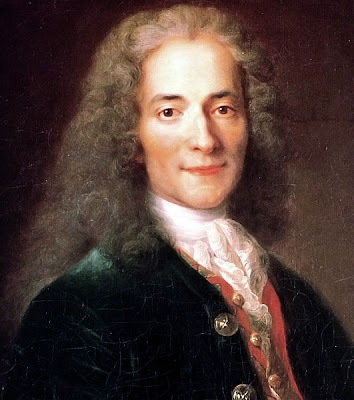 The Bastille's most well known literary inmate was the historian and philosopher Voltaire. Like many who were unceremoniously dumped in the Bastille, he was imprisoned for a crime he did not commit. And like many writers before and after, Voltaire's alleged "crime" was insulting a member of France's royal family. In 1717 Voltaire was accused of penning a satirical verse mocking Philippe D'Orleans, Regent of the Kingdom. He cooled his heels in a cell for nearly a year, until the real author of the poem was unmasked. 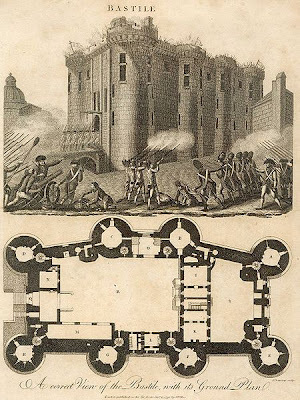 The Bastille was not an equal opportunity prison. Well-to-do prisoners were allowed to furnish their own cells, making them homey and comfortable. Voltaire must have had a desk brought in on the double. A writer to the core, he made use of his unexpected vacation from the distractions of everyday life to pen his first play, Oedipe. Upon his release, the play was produced, became a hit, and Voltaire's career as a writer had begun. Alas, the wit that made Voltaire a prime suspect in the previous poetical crime had not been dulled by his stretch in a cell. His clever remark at the expense of a nobleman once more ended with a dreaded lettre de cachet, the all-purpose arrest warrant of Kings. Prisoners had no trial, no judge, no jury. It was straight to the Bastille. Most inmates never even knew what had earned them a few months--or years--at His Majesty's pleasure. This time Voltaire only left the Bastille with a promise to exit the green, green grass of home forever, and begin a new life as an English expat. 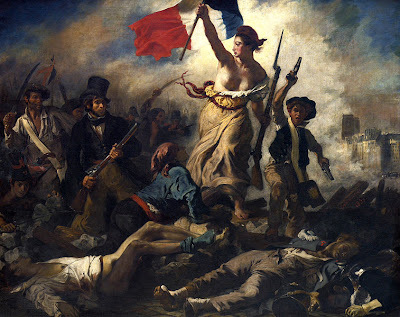 Historical Epochs of The French Revolution. Voltaire was far from the only literary luminary to vacation in the Bastille. While the prison's accommodations varied greatly depending on the inmate's wealth, one could never accuse the Bastille's wardens of sexism. Both men and women were relocated to this temporary home-away-from-home. No one took greater advantage of the co-ed quarters of the Bastille than famed memoirist, Madame de Staal de Launay. In 1718 she landed in a cell as part of a plot to depose Philippe d'Orleans. During her two years in stir, she carried on a legendary love affair with fellow prisoner, the chevalier de Menil. As detailed in her memoirs, their status as prisoners proved less of an impediment to their trysts than the unwanted attentions she received from her jailer, the chevalier de Maisonrouge. Drawn By Charles-Amedee-Philippe van Loo in 1760. 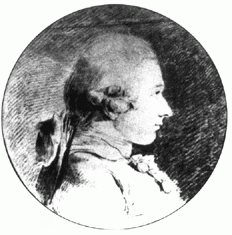 The most notorious writer to serve time in the Bastille was the patron saint of pornographers, the Marquis de Sade. The Marquis was what we would today term a "recidivist" spending 32 of his 74 years in various prisons and insane asylums. Ten of those years were whiled away in the Bastille. De Sade's last stretch in the prison was his most infamous. In 1784 he was transferred to the Bastille from his previous quarters in the dungeons of the prison at Vincennes. He remained in the Bastille for five years, during which he wrote his most famous work Les 120 Journées de Sodome. 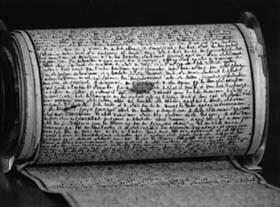 Having to make do with the writing materials at hand--and fearful that his scandalous writings might be confiscated by prison authorities--the manuscript was written on a continuous scroll, which was then hidden in his cell. Les 120 Journées de Sodome. Less than two weeks later the Bastille was stormed and looted. While some claim the prison was targeted as a symbol of injustice, censorship, and despotism, the motive of the revolutionaries was probably more practical. Large amounts of gunpowder and weapons were housed in the prison. When the cell doors were unlocked for the last time on July 14, 1789, only seven prisoners remained: four forgers, two lunatics, and a young "sexually deviant" nobleman. 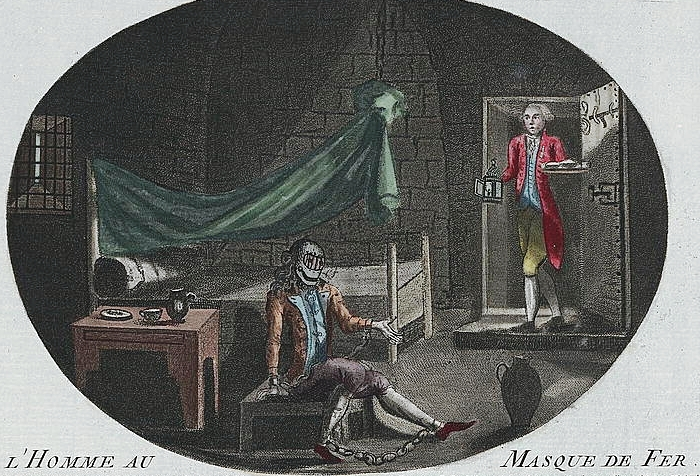 An Anonymous Etching Of The Man In The Iron Mask, c.1789. Voltaire, Madame de Staal de Launay, and the Marquis de Sade were merely the best known of the Bastille's literary inmates. Others included François de La Rochefoucauld, Rene Auguste Constantin de Renneville, and Louis Pierre Manuel. And many writers made wonderful fictional use of the prison's unique setting. Alexandre Dumas wrote The Man In The Iron Mask, one volume of The Three Musketeers, based on tales of a mysterious real-life masked prisoner in the Bastille. And Dickens's Tale of Two Cities revolves around the eighteen-year imprisonment there of Dr. Alexandre Manette. The Bastille also figures in works as diverse as The Scarlet Pimpernel, A Little Princess, and Les Miserables. The French National Library's exhibit, La Bastille, or Living In Hell continues in Paris through February of 2011. Whether or not you can visit the show in person, it serves as a reminder that the written word can be a dangerous thing. Given the choice of losing their liberty or putting down their pens, writers over the centuries, and throughout the world, have chosen to live in chains. We owe it to them to protect freedom of expression and freedom of the press whenever, and wherever, they are threatened.